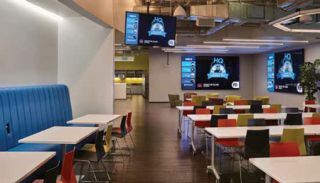 Software company Rocket Fuel recently moved into a new headquarters which features a conference center with more than 50 meeting rooms, each equipped with Crestron technology. Think of it as the Tyrannosaurus Rex of AV projects. Because in the world of AV ventures, a mega project—one of those huge, campus-wide undertakings—has the potential to make or break an AV firm’s entire year. Here’s something you can depend on: There will be unpredictable challenges in your mega project. The trick is to be well prepared.